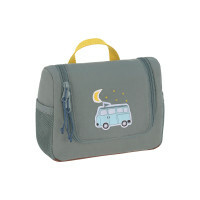 LÄSSI'G’s toiletry bag, Mini Waschbag in the Adventure design – in blue with a bus – is made for children and their adventures whether on holiday or at home. The trendy design and well thought-out layout make it a cool travel companion. 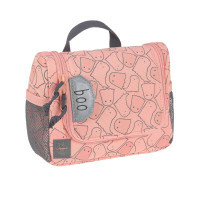 Product information "Mini Washbag, Adventure Bus"
Soap, shower gel, skincare products and a hair brush can all be stowed in the well-organized main compartment. Toothbrush, toothpaste and accessories like hair clips can be placed in two inside mesh pockets and in the separate zipped pocket. The water-repellent material, the hook for hanging the bag up and the removable mirror included in the set, make it particularly useful. A small, clear name badge sleeve prevents any mix-ups. 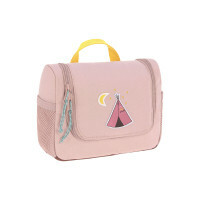 The trendy Adventure design in the two versions – dusky pink with a tipi and in blue with a bus – combines warm earthy shades and yellow color accents. 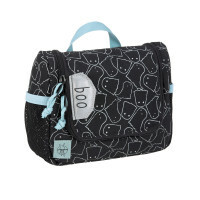 The Children’s Washbag is also available in the various designs of LÄSSIG’s other Children’s Collections.